After coming out with the universally acclaimed 559 tacky flux, Amtech™ is back again with another amazing no-clean tacky soldering and rework flux: The VS-213-A-TF. 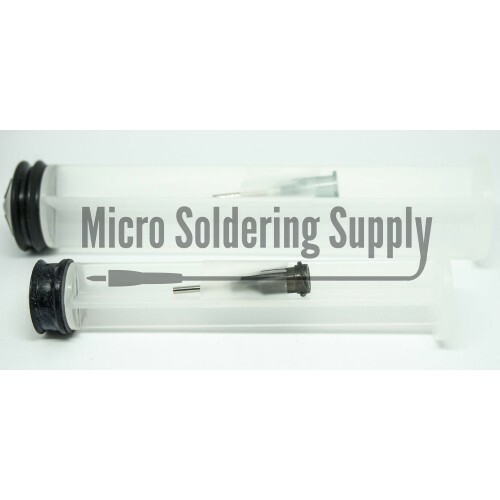 The engineers at Amtech™ specifically formulated it for fine pitch BGA soldering and rework like that found on iPhones and Macbooks, with a special consideration to not only leaded but lead-free soldering. The ultra low void means fewer air gaps and a longer wetting period, or in other words, you will get a strong solder joint the first time, every time. Plunger and needle sold separately. 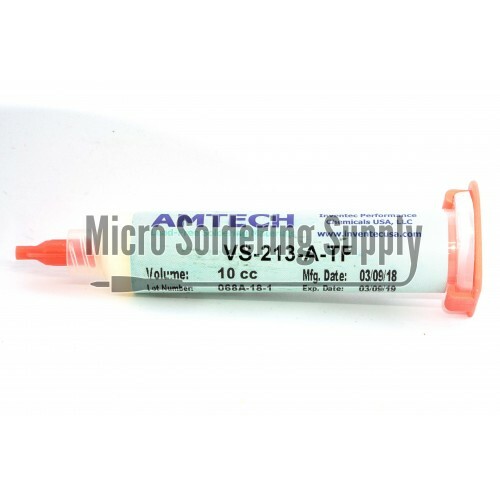 Amtech™ NC-559-ASM-TF No-Clean Tacky Flux10cc syringeThis is an excellent no-clean tacky soldering a.. 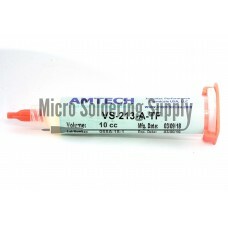 Mechanic XG-50 leaded solder pasteSn63/Pb37A superb leaded solder paste. Sn63/Pb37 eutectic formula .. Mechanic LY-UVH900 UV curable solder mask10cc syringeThe next best thing since no-clean flux! UV cur..
Amtech™ NC-559-ASM-TF No-Clean Tacky Flux30cc syringeThis is an excellent no-clean tacky soldering a..
Laser for curing Mechanic's UV solder mask405nm wavelengthA powerful UV laser beam is easy to direct..
SRA No-Clean Flux Core Leaded Eutectic Solder 63/37, 0.020"
An industry-leading leaded solder with an eutectic 63/37 mixture provides even solidification for te..
Amtech™ VS-213-A-TF No-Clean Tacky Flux10cc syringeAfter coming out with the universally acclaimed 5..